Did you know that you can purchase Sport Fans from SignOutfitters.com? These sport fans are great to show support and school spirit. 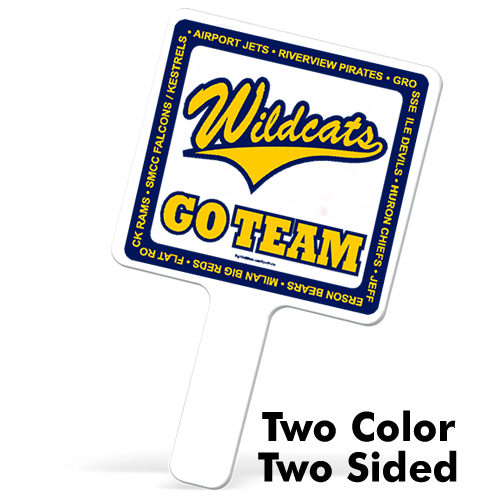 These rally fans are great for fans to wave around at football games or keep fans cool at swim meets. These custom sport fans would be a good idea for a fundraiser. Fans will love to cheer your team on with something unique. Not only are rally fans useable at sporting events to show your school spirit, they also make a great keepsake when the season is over. Collect autographs of your teammates or your favorite athletes. Sell in High School Bookstores, College Bookstores, and door to door fundraising. Don't get surprised by the Fire Marshal any longer. 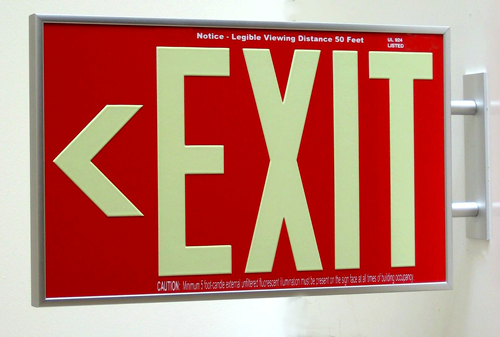 These photoluminescent exit signs have been tested and listed by Underwriters Laboratories, Inc. in accordance with the UL924 Standard for Power and Lighting. These signs are in compliance with NFPA Life Safety Code 101 and OSHA requirements. Meets or exceeds IBC, ICBO, BOCA, and NFPA 5000 building codes. All that means is that these signs meet building regulations. Not only are these signs in compliance, they also look good. At SignOutfitters.com you can get these signs with a side mount, ceiling mount, or a wall mount bracket. These emergency exit signs can be used in both high and low level applications, require no power, are eco-friendly and virtually fail safe. This summer stop on by SignOutfitters.com for some large yard signs. This deal will allow you to get 10% off of 48" x 96" Corrugated plastic yard signs. These signs are digitally printed so there is no color limit. Order as low as just on sign. These large corrugated plastic yard signs are the "Big Daddy" of yard signs. Works great for political candidates, real estate offices, or any business really. Ask for grommets and you now have a large sign to hang. Ordering is easy just call 1-800-513-1695. Our friendly sales representatives will gladly help you out. Don't forget to mention code: TENOFF4X8, to be sure to get this deal. Are you planning a golf outing? Maybe you are a golf course attendant who hosts many outings. One of the ways to help with the costs of the outing is through sponsors. As a golf course you may want to recommend sponsorship signs. These sponsors help donate money to the cause. SignOutfitters.com has the perfect way of showing off these sponsorship's. 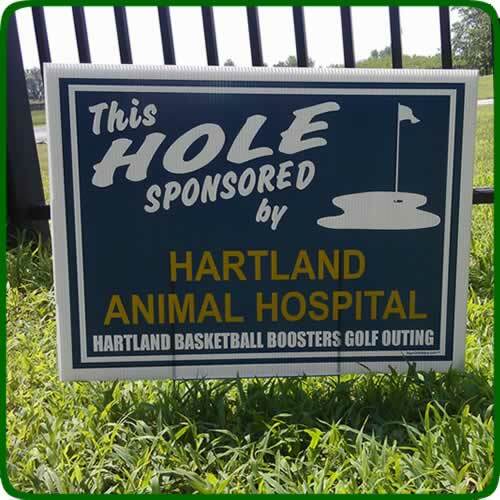 Golf Hole Sponsor signs will show off your sponsor names with a sign that will let the name stand out. With a 15" sign stake included you can place these sponsor signs at the tee boxes of different holes. Your golfers will see your sponsor names where ever you place the signs. These signs are digitally printed and ship out very fast. These signs can be customized with your golf outing and the sponsor names laid out easily. Signs feature This Hole Sponsored by with a clip art of a golf green. Other golf sign templates can be found here.